Milind Soman became the world's heartthrob when he starred in Alisha Chinai's music video, Made In India in the year 1995. While the actor became a popular TV face for his stints in Captain Vyom and Sea Hawks in mid-1990s, it is a very lesser known fact that he made his TV debut with another show. And the show's name is A Mouthful Of Sky. It aired in 1995 on DD National. It was the first serial to be ever made in English which was produced in India. The script was made by Ashok Banker and starred actors like Rahul Bose, Milind Soman, Samir Soni, Ayesha Sharker, Simone Singh, R Madhavan, Kushal Punjabi, Parvin Dabbas, Krutika Desai Khan and others. The plot dealt about five MBAs who reunite 13 years after graduation to confront a macabre secret from the past which a group of ruthless enemies use to try to destroy them. It was a crime-thriller structured with multiple subplots and also dealt with urban Indians from various communities and their struggle to mix the inherent contradictions of their Indianness with their westernized outlook and language. 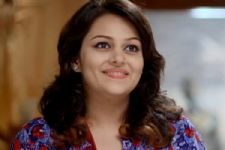 Directed by Anant Balani, Mahesh Bhatt and Ajay Goel, the show went on to set some extreme standards for the future of TV. 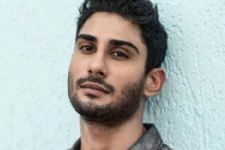 Amazon Prime's '4 More Shots Please' ropes in popular Bollywood actor! 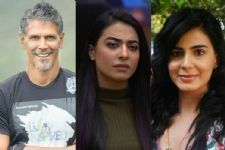 Milind Soman, Bani J, and Kirti Kulhari to star in a Web Series on Amazon Prime! 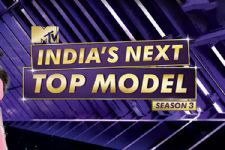 And the WINNER of of 'India's Next Top Model' is.. 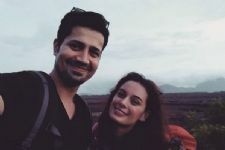 Permanent Roommates' Sumeet Vyas on British show - Stupid Man, Smart Phone's Indian Edition! And we have proof of the same..
Bipasha Basu and Milind Soman at 10,000 Women Registration Of Pinkathon !